lid, and I am desperately trying to find, something that I could say, that, maybe Falk hadn't got it quite right? But! Once again, I'm speechless, 100% perfection in goods and service. I made some awesome jerk chicken in this pan for unexpected visitors. the washing -up as well ) I was on a roll, my visitors next meal, was a risotto, one pan, one mega meal for seven. My collection of Falk pans are truly value for money, I've already been in touch with Falk for my next purchase, a 18cm pan, that it's soul purpose will be for making souffl. Falk are actually, making this possible for me, by getting a 18cm pan delivered without the handle. This is such fantastic customer service! 363 customers found this review helpful. Did you? Yes, I did! Awesome pan, perfect size for large family roast at the holiday. The heavy weight is a benefit. 558 customers found this review helpful. Did you? Yes, I did! I have a decent collection of copper and enamelled cast iron pans...but this pan has become my favorite. Its size is big enough for my Family and guest. The pan also looks great in my dining tables. The balance is outstanding and heat distribution, expectedly amazing. Bought the lid separately. 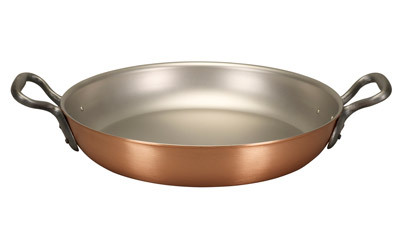 If I were to choose one pan for my cooking, this would be it. Good pan - can be used for sauté. Found a bit shallow recipes with large chicken drumsticks as lid does not then fit, 0.5cm deeper design would be nice. 562 customers found this review helpful. Did you? Yes, I did!